For rapidly cracking and pulverizing heavy concrete debris into aggregate, with 100% collection of rebar using high powered built-in electro magnet. 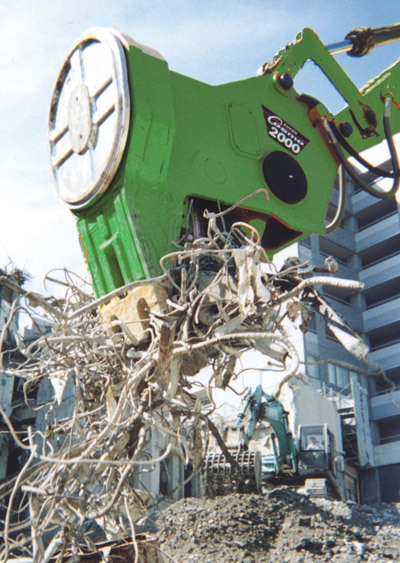 – Powerful, built-in electro magnet will collect ALL rebar from concrete debris for recycling, leaving high-quality aggregate. On/off control allows magnet to operate while Cosmo is pulverizing. – Extra high-capacity speed valve for rapid cycle time, providing full speed during crushing stage. – Patented breaker tooth splits concrete on initial contact, using 40% less power than conventional teeth. Maintains constant force during entire closing arc. – Light weight to fit lighter carriers; easy to mount and connect. – Built for durability and safety: monobloc frame of heavy-duty steel, trunnion-mounted cylinder, vibration-isolation structure with top guard to protect generator from falling debris.